Yes, Galentine’s Day is totally a made-up holiday, but it’s one I can get behind! Galentine’s Day falls on February 13, and it’s a time to get together to celebrate your best girlfriends. The How I Style It crew is back this month to showcase cute Galentine’s Day outfit ideas, of course! Be sure to check out Becky, Della, and Nicole’s looks for Galentine’s Day. And I’m sharing some easy ideas to celebrate with friends! My Galentine’s Day outfit is a mix of soft and edgy. 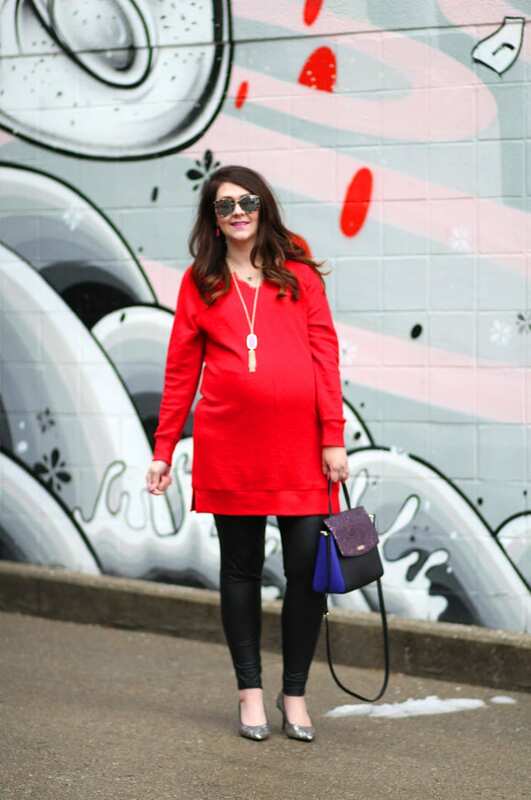 I found this terry tunic on the Maurice’s sales rack this weekend for $10, and knew it would be perfect. 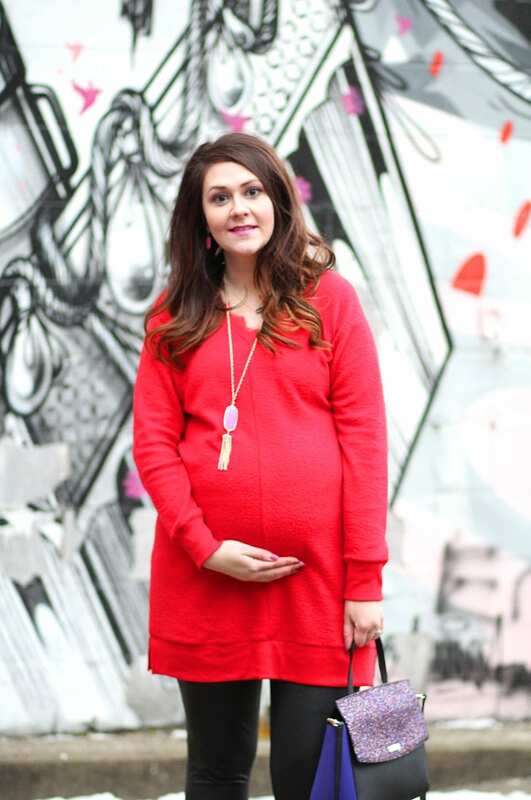 It’s actually long enough to wear as a dress, but I paired it with leather leggings. For Galentine’s Day, I’m hoping to head out to dinner with my friends. Here’s five easy and fun ideas to celebrate Galentine’s Day. 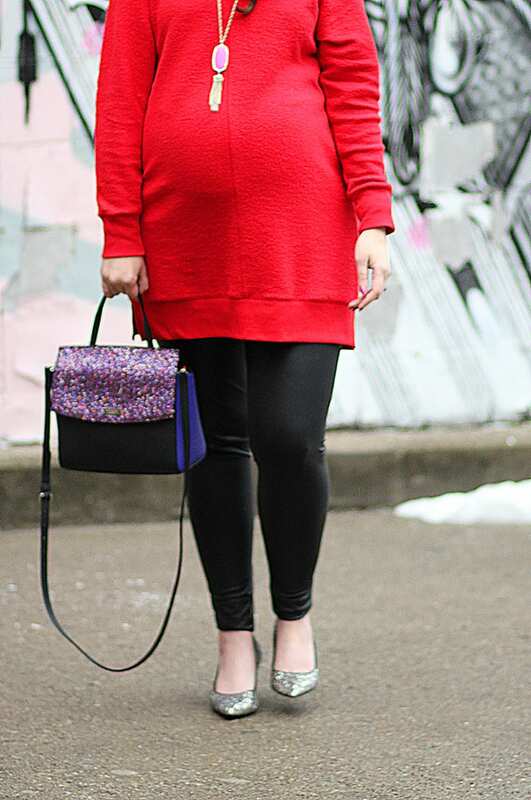 And don’t forget to hop over to Becky, Della, and Nicole’s blogs to see more Galentine’s Day outfit inspo! 1. Head out to a fancy dinner with friends. Make reservations and hit up a nice restaurant where you can linger over your meal. 2. Have a sleepover. Round up all of your favorite friend movies (think Mean Girls, Clueless, etc) and invite your galentines over for a sleepover. Have everyone bring their favorite drink, and toss some Valentine’s Day M&Ms in with the popcorn. 3. Get pampered. I love relaxing with my friends. Go get pedicures, schedule a couples massage, or head to Sephora for makeovers (they’re free with a $50 makeup purchase). 4. Learn together. The latest spin on craft nights is to take a class together. You can do a painting, learn handlettering, or make a wreath. I love that idea of a clothing swap!! I’m going to have to try that with my friends!! Such a cute idea to take a class together and learn or brush up on a skill together! I didn’t know that Galentine’s Day is on the 13th. Good to know! My friend and I once had a craft night for a bunch of local women and we should do something like that again! What a fun and edgy look! I love getting together with the girls! Oh I love this look! 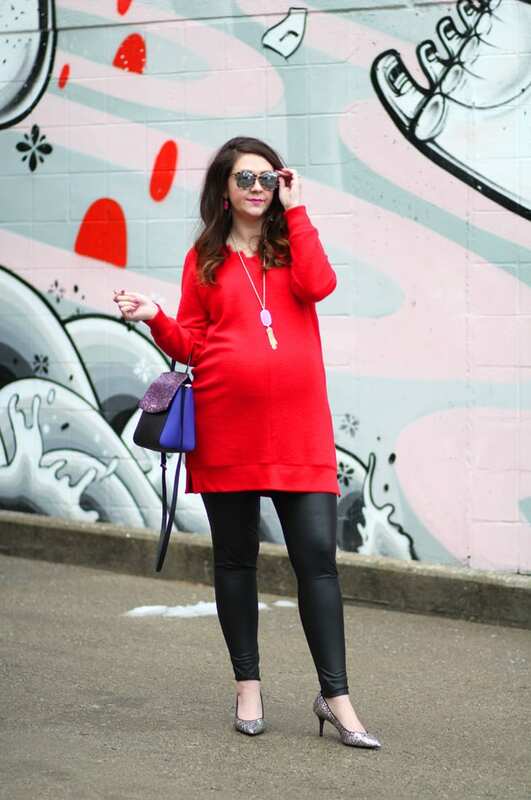 The faux leather leggings is a staple and the red sweater is really pretty together! 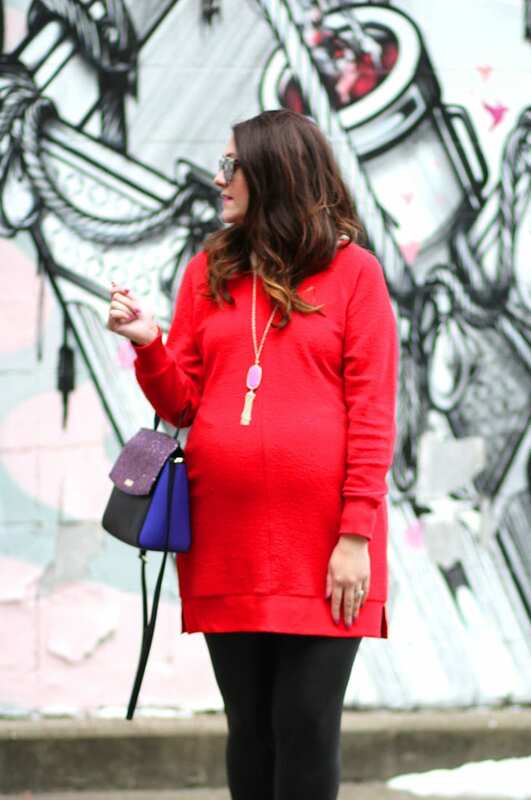 I love the red sweater and pink necklace together! Fabulous glittery bag too! Love the shiny, glittery bag that will go with everything! 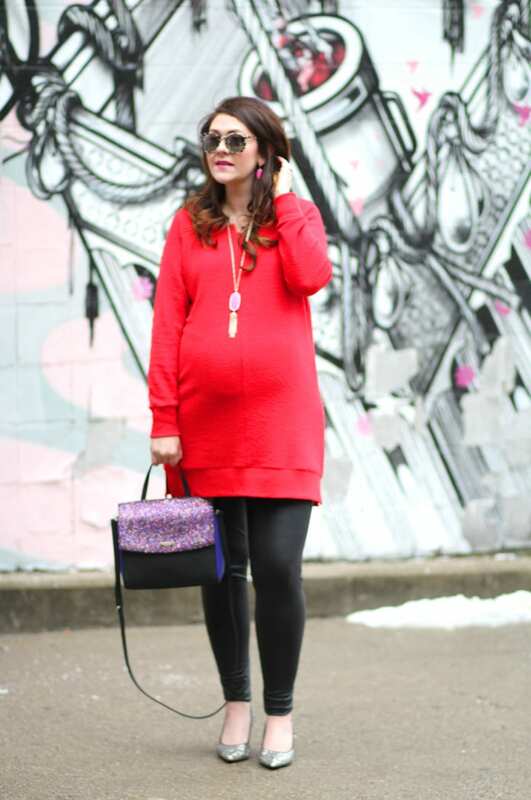 pretty in black and red , one of my fav V day color combos! love this look right down to your sparkly shoes!